Where: Purcell Pavilion | Notre Dame, Ind. - Notre Dame and Georgia Tech will meet for the 19th time on Sunday. Georgia Tech leads the series 11-8. - Notre Dame is 7-2 against Georgia Tech at Purcell Pavilion. - Forward John Mooney leads the ACC in double-doubles with 14 in 23 games (14.3 ppg, 10.7 reb). - Mooney is one of six major conference players averaging a double-double and the only ACC player averaging a double-double. - Prentiss Hubb is one of nine true freshmen since 1972-73 to reach 80 assists in his first year at Notre Dame. It was a close game the last time these two programs played on January 22nd as the Yellow Jackets pulled out a 63-61 win in Atlanta. Georgia Tech has lost four games in a row since the victory over the Irish while Notre Dame has lost three games. We can talk about Georgia Tech’s zone defense but this one is about Notre Dame’s offense or the possibility of offense. Notre Dame has scored 70 or more points twice since ACC play started in January. 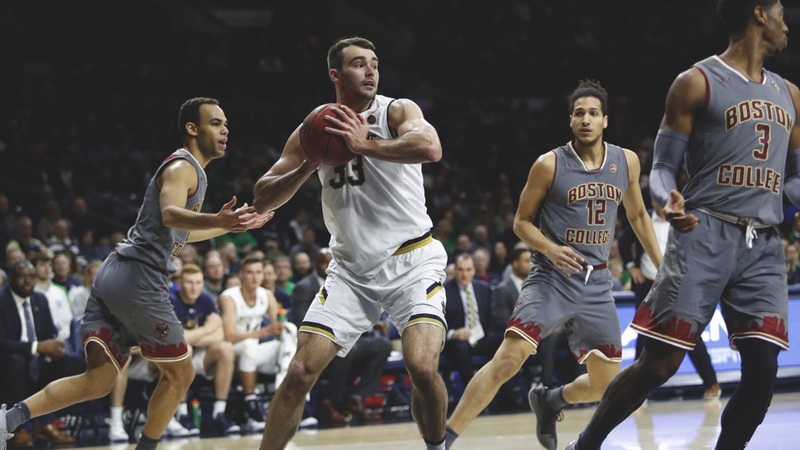 Mike Brey’s team was coming off a 79-73 win last Saturday at Boston College but the Irish turned in one of the worst performances of the season on Wednesday in a 62-47 loss at Miami. Notre Dame shot just 32% from the field and 14% from three-point range. The most disturbing aspect of the loss for Notre Dame was the lack of effort displayed by Notre Dame against another below average ACC program. Brey was concerned with the effort and met with each player on the way back from Miami on the plane. The message on the plane was about how Brey loved coaching his team, but at some point, there needs to be some tough love as the Irish desperately to show improvement. We have really sharp guys. They are hard on themselves. I have to find ways to keep them moving and confident or repair confidence. It’s much more teaching. This section of the preview feels like a broken record but Notre Dame’s offense continues to be problematic and things won’t get better for the Irish until they figure it out. Can Brey find life with a lineup or even one or two players over the final month of the season? There have been no signs of that to this point. “We’ve struggled with as a staff how to help them offensively. Are we in more sets? Sunday will be different because we’re going to be playing against zone for 40 minutes. You have to be good with the ball. But against man-to-man, how do we help them? “The night before the Boston College game, I was talking to the staff and talked about putting in something completely different offensively. I’m thinking we might have found this thing. Feeding the post is good to us. To have Juwan (Durham) back as a post-release is good. John (Mooney) has been the only guy for a while. Juwan is good with the ball and can score for us a little bit. Georgia Tech might not be the team to fix offensive woes as the Yellow Jackets will play zone the entire game. It’s also not a good omen for the Irish as they are coming off a game where they shot 14% from behind the arc. “They have shot blockers and they are committed to it,” said Brey. “It’s similar to attacking Syracuse’s zone. You have to really work. We have to get some middle touches. We had different guys in the middle down there last time we played. Until the Irish find something on offense, I’m not sure I feel comfortable predicting a win.